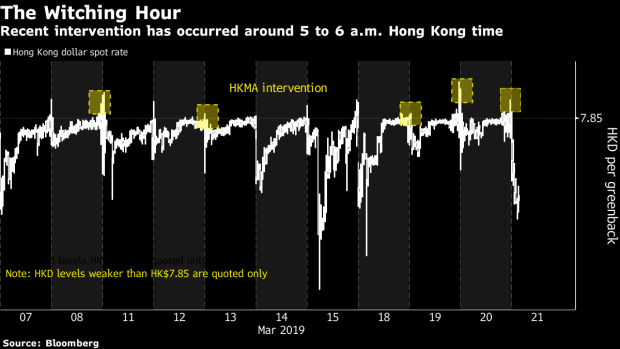 All five instances the Hong Kong Monetary Authority has recently bought the local currency to keep it from falling below the weak end of its trading band have been around 5 a.m. to 6 a.m. local time. A lack of market liquidity -- blamed for extreme moves seen in recent years in the yen, pound, euro and Swiss franc -- is the issue here too. After New York traders have gone home and before Asia is fully open, it’s easier for large sell orders to push the HKMA into action, said Alan Yip, a senior foreign-exchange strategist at Bank of East Asia Ltd. This was the case again Thursday, when Hong Kong’s de facto central bank bought HK$3.54 billion ($451 million) of local currency just after 5 a.m. local time. The Hong Kong dollar has fallen to the weak end of the trading band at HK$7.85 repeatedly this month as its wide interest-rate discount to the U.S. dollar makes it profitable to short the city’s currency. That has prompted the HKMA to spend $1.5 billion to defend the exchange-rate peg to the greenback over the past two weeks, driving up the local currency’s interbank borrowing costs. While investors during U.S. hours are mostly interested in shorting the Hong Kong dollar, local banks sometimes buy it during the Asian workday for use in the city, said Ryan Lam, head of research at Shanghai Commercial Bank Ltd. That tendency can help cap the Hong Kong dollar weakness that prompts intervention. The city’s currency rose 0.01 percent to HK$7.8492 as of 8:35 a.m. local time Thursday.